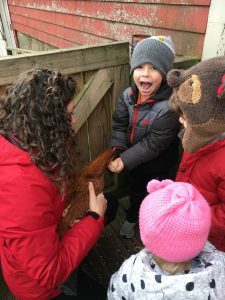 Kids and a parent or guardian are invited to come get their hands dirty helping to take care of the barn animals of Endicott Park. They will get to feed the animals, re-bed the stalls, collect eggs, and maybe even groom the smaller animals! Each class will largely be the same, so please sign up for only one date to begin with. If your child would like to come back, you may sign up for another date! Boots or shoes that can get dirty are recommended.